Robocalling scammers often fake their outbound phone number that shows up on your phone, a trick known as “spoofing.” Instead of a strange number you could see your bank’s number, or an area code and prefix that’s the same as yours. Generally, people are more likely to answer familiar numbers, and a fake number helps cover a crook’s tracks. Spoofing also makes it impossible to block a caller, who can simply switch to a different fake number. The good news here is that new telephony standards neutralize spoofing. The new standards are STIR (Secure Telephony Identity Revisited) and SHAKEN (Secure Handling of Asserted information using toKENs). Using digital certificates based on public key encryption techniques, STIR/SHAKEN enable carriers to verify that a calling phone number has not been spoofed. A “Caller Verified” tag will appear on the call recipient’s screen. If a phone number fails the STIR/SHAKEN test, a warning such as “Scam Likely” may appear instead. Right now, T-mobile can only verify calling numbers that are on its own network. When other carriers implement STIR/SHAKEN, a T-mobile customer will be able to know that a Verizon phone number is legit (or AT&T, Sprint, etc.). Customers will be able to block calls that are not verified by STIR/SHAKEN. But they may not want to be that picky. There will be times when a carrier can only partially verify a number; for instance, if the call originates from inside a corporate PBX phone system. When STIR/SHAKEN is implemented by all major carriers, the only phone numbers that cannot be verified at all will be spoofed scam calls, in all likelihood. It will be safe to block this entire category. Unfortunately we’re still years from eradicating spoofed phone numbers, and we will never be free from scam callers entirely. In the meantime, there are other weapons you can use to fight robocalls and scams. T-mobile introduced its free Scam ID and Scam Block protection in March, 2017. It relies on a proprietary database of phone numbers T-mobile believes are used by scammers. The database is constantly updated as T-mobile analyzes each call that enters its network, looking for calling patterns that suggest sketchy activity. Scam ID alerts a customer that an incoming call may be a scam; enabling Scam Block to automatically block calls from suspected scammers’ numbers. Since November, 2018, T-mobile offers Name ID, a blocking and enhanced Caller-ID service that requires an app. Name ID lets you block and unblock individual callers from your call log. It can identify incoming “unknown” callers who don’t send their caller-ID data by matching calls to a database of over 600 million companies and individuals. Individuals or categories of callers in that database can be blocked – i. e., telemarketers, political organizations, survey companies, etc. The T-mobile ONE Plus plan includes Name ID; other postpaid customers can add Name ID for $4 per month. The AT&T Mobile Security & Call Protect app looks an awful lot like T-mobile’s program, and also carries a $4 fee for “Plus” service. One plus is that it comes with AT&T Mobile Security, to help protect your phone from mobile malware, viruses and system threats. Like T-Mobile's offering, you can choose entire categories (Telemarketer, Political Calls, etc.) of callers to allow, send to voicemail or automatically block. One unique feature is Reverse Number Lookup, which allows users to enter a U.S. number to get caller details. Sprint has charged $2.99 per month for Premium Caller ID since December, 2016. As far as I can tell, it does not differ from the T-mobile or AT&T offerings significantly. It's a shame that these three mobile carriers are charging a fee to solve a problem that their customers should not have to deal with. Verizon’s Call Filter app seems very similar as well, with one important exception. Currently $2.99/month, Call Filter will become free in March, 2019. Verizon says that its system correctly identifies potentially bogus calls approximately 93 percent of the time, and has amassed a database of 300 million spam and robocall numbers. "This service identifies spam callers and unknown numbers by name and shows an innovative risk meter that displays the level of spam risk associated with a call," a Verizon rep said. You don't have to use a call blocking app provided by your mobile carrier. There are several popular apps for Android and iPhone users. TrueCaller is perhaps the most popular robocall-fighting app. It claims 250 million users worldwide, and that its apps include the world’s best Caller-ID. TrueCaller blocks robocallers and telemarketers; identifies unknown callers; and performs messaging functions too. Available for iPhone and Android, TrueCaller is ad-supported with in-app purchases that unlock premium features. I used TrueCaller for a while, but I was not happy that it constantly insisted on replacing my phone's calling and texting apps with it's own. Hiya is a similar smartphone app that some AskBob readers have said works well for them. So I gave it a try. Hiya claims a database of 1.5 billion phone numbers, and it can block calls and text messages, or blacklist unwanted numbers. It's free, available on both Android and iPhone, and contains no ads. I was happy with Hiya because it let me use my own call and text apps, and it did a good job of identifying bogus numbers. But the app kept crashing. I tried reinstalling, but that didn't help, so I moved on. The CIA Caller ID & Call Blocker got some good reviews, so I tried it next. Bottom line, I found that it did a pretty poor job of identifying callers; even local businesses were reported as "Private Number." It also had too many in-your-face ads popping up on the screen, and it was harder to add callers to the block list. Nomorobo is one third party company that offers anti-spam services. The company, which won the FTC’s Robocall Challlenge, in which many companies competed to come up with the best anti-robocall technology. Nomorobo has crowd-sourced over 1.3 million phone numbers used by spammers, and adds new numbers identified as spammers by its customers. The Nomorobo service is free for VoIP-based landlines. If you get phone service via your high-speed Internet bundle, you almost certainly have a VoIP line. Supported VoIP carriers include AT&T U-verse, Charter Spectrum, Comcast Xfinity, Verizon Fios, Ooma, Optimum, TImeWarner Cable, and Vonage. For mobile phones, it costs $1.99 per month to protect your Android or iPhone with Nomorobo. Unfortunately, Nomorobo is not available on traditional copper-wire landlines, or on the Magic Jack device at this time. Google Voice is the best solution I know of for good old-fashioned copper-wire landlines. When you forward your landline to a free Google Voice number, calls are automatically answered, voicemails are transcribed into text, then emailed to you. Of course, you can answer calls from numbers that you know are real people. Google Voice blocks many known phone spammers, but you can selectively silence or block calls from as many numbers as you like. Most recent comments on "[SHAKEN OR STIRRED?] Blocking Phone Scams and Robocalls"
Bob, I have been using Call Blocker for about a month. So far it works and is simple to use. Mostly a result of my family's making political contributions by phone, we now, on many days, get phone calls every few minutes (I still have a landline.) "Private Number", "Out of Area", "Caller Name Unavailable". My phone service is Spectrum. What would be the best action for me to take? There is no such thing as a legit robocall. Period. EDITOR'S NOTE: Not so fast... If you work at a school, or have children who attend, robocalls are sometimes needed to quickly notify people of delays or closings due to bad weather, late buses, emergency situations, etc. I don't answer calls that I don't recognize. I figure that's what voicemail is for. And if they don't leave a message? It it couldn't have been that important. I have my mobile service through Comcast/Xfinity, which is actually Verizon service resold through Xfinity. Can we assume that Comcast/Xfinity will pass through Verizon's Call Filter App (or a cosmetically variant of such service, once Verizon makes its Call Filter free in March, 2019? Didn't this whole robocall mess start because of the oxymoron called "legit robocalls"? FCC has allowed this mess to become like the proverbial tail that wags the dog! My outgoing recording states "Please announce name, and call purpose so that this automated messaging system can allow me to decide if I will return your call promptly." But only if the robocall is missed by nomorobo. That is as much effort as I am willing expand on this FCC imposed burden to all of us. Really Jim? I receive doctor and medical facility robo-reminders of upcoming appointments and the VA DOES THE SAME! The VA robo identifies me and tells me what/where my next scheduled appointment is. It asks me to punch 1 to confirm the appointment or 2 if you do not agree with time/place. Quite helpful actually... I'd say those are 'legit' robocalls. My phone has an option to announce the caller. If it is a name, I know it is one of my contacts and I can answer. If it announces a number I just let it go. I would guess if it is a legitimate call, the caller will leave a message and I can call back - spammers never leave messages. I still use a landline with caller ID. Since I know who my friends, acquaintances, and legitimate businesses are, I proceed to answer. I don't answer suspicious numbers. Also, if a business is legitimate, they are professional and leave a message. I agree with Jim that there is NO such thing as a legitimate robocall. A legitimate business does NOT resort to the lowly means of robocalls. I also agree with Bill above that the "Do Not Call" list is a joke. This is partly because the government uses outdated technologies, whereby, the hucksters, spammer, scammers, and fraudulent schemers keep up with the latest in spoofing technology. The bottom line, whether it pertains to computers, internet activity, and phones, it is vital to always be on guard. There are too many frauds out there involving bad guys that are all too happy to see one's money parted from them. The important rule is that if it seems too good to be true, then it definitely is too good to be true! Within minutes of plugging a phone/answering machine into our new AT&T landline the phone started ringing with robocalls, to the AT&T tech's surprise. While setting up our online account with them I discovered and installed Call Protect. The line has gone almost silent. Our mobile carrier is T-Mo and though we appreciate their new identifier, my question to them is if you are able to identifiy a call as "Suspected Spam/Scam" why do you allow it to go through? And why are you still limiting us to 10 names/numbers on our Call Reject lists?? And why do you allow some of those rejected numbers to go directly to voicemail with no indication we've even received a call except to see a voicemail notification? You have no idea the reason why a customer has added a number to the reject list. There are numerous legitimate reasons for someone to reject an identifiable phone number. No, the answer is not for us to pony up more money to protect ourselves from something you should be doing under the DNC law for free. Based in the UK and using landline: TrueCall (not the same as Truecaller) actually prevents the phone from ringing at all for callers who are not whitelisted until they have personally identified themselves. (It might also work for mobile/smart phones, but we haven't tried that). I think the feature of not letting the phone even ring is excellent - I can check Truecall's weblog from time to time and gloat over those failed calls which didn't even disturb our afternoon naps! I got a telly zapper a few years ago. When a telemarketer calls, my phone rings once and the Tele zapper Send a tone which indicates that the phone is disconnected. The Tele marketer might use that response to remove the number from their list. 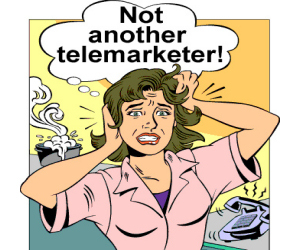 A few telemarketers get through, but the device blocks most of them. I'M BOMBARDED with Robo-callers. I've taken advantage of my Panasonic's 300 "Block Caller", but with this 'Spoofing'... these calls kept coming in. So I changed my outgoing message: "Tired of Robo Calls. Leave your message & I'll call you back"
Also, I turned down the volume of both the "Ring" and incoming messages to a whisper. I might go with NoMoRobo, since I'm on AT&T's Uverse. I also no longer answer calls from numbers that I don't recognize but my experience with letting the calls go to voicemail is different that some other commenters. Quite often the spammer/scammer does leave a message, i.e. "Important information about a medical device" or "You owe the IRS money and we've notified the police". Luckily these calls are easy to identify. As a delivery driver though, people's reticence to answer the phone anymore has made my job more difficult and slowed my efficiency. If I need to contact a customer about their order, 3/4 of the time they don't answer their phone and I have to leave a message and then wait until they call me back - resulting in slower delivery times. Thanks Bob for a great article! I am on a landline with no caller id. If I have time I spoof the callers and waste their time. At times I start speaking German and they hang up quick. What we need is a do not call list without any exceptions. No poles, charities, politics nor sales pitches. I use Youmail for iPhone. There is a free and paid version. I use the free version. It's great for weeding out spam calls and also offers text transcription. Recommended. What about Robokiller? It wastes the time of the robomarketer and even lets you hear the interactions between the telemarketer and the app. I don't have it yet but I understand it can be quite amusing. I use an app called Blacklist Pro (yes, if they work well enough, I pay for them) on my cell phone. It blocks most nagging calls, and also allows me to specify entire area codes and/or exchanges. That may seem extreme, but I was receiving multiple calls a day from the same sales pitch for Medicare, and the same area code/exchange from which I have no reason to expect any other calls, so I blocked all calls from that sequence of numbers. I'd like to see ALL companies make an app that only allows calls from my "contacts" list to go through, including "texts" & or "short codes". I'd add names/numbers from those I want to communicate.